This Parador is located next to the Romanesque cathedral of La Seu D'Urgell in a historical area which attracts many tourists. Inside the Parador of La Seu D'Urgell , the cloister has a tropical appearance thanks to the profusion of ivy, hanging plants and landscaped galleries. This is also true in the high glass roofed lounge. The rooms of the hotel are light and the furniture and funishings are modern to give comfortable living with elegance, Similar decor is used in the bedrooms of which many have views of the mountains. The hotel restaurant features cooking of the high mountains with a rich variety of dishes such as trout, game meat, pates, cheeses and broth. International dishes are also available and there is a special gluten free menu. Many guests comment on the very good buffet breakfast served at this and other Paradors. The nearby old town centre is dominated by the magnificent cathedral of Santa Maria, a Romanesque building dating back to the twelfth century. Its cloister has beautifully carved columns and the museum has a very valuable collection of medieval art. Another place of interest is the church of San Miguelwhich was built in the same period. The Sant Ermengol Fair and the Pyrenees hand-made cheese Fair are very popular. Both are celebrated on the third weekend of October and give an opportunity to taste the various cheese and wines of the region. Every Tuesday and Saturday a traditional market is held in the town. For 700 years, the bishop was also the joint ruler of nearby Andorra which should be visited being so close. 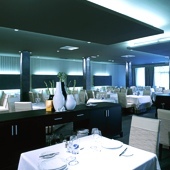 The Seu D'Urgell Parador is well placed for the skiing resorts of the Catalonian and Andorra Pyrenees. The world famous canoeing championships are held on the nearby river Segre during the summer. The Parador has sixty twin bedded rooms, twelve rooms with a double bed, six single rooms and one suite. All the rooms have a private bathroom and also a telephone, satellite television, TV canal plus, safe, mini bar and wireless internet. There is air conditioning and central heating, currency exchange, lift, free internet access in communal areas, garage, piped music, satellite television, gift shop, restaurant and bar. Facilities are available for business meetings and for the disabled. 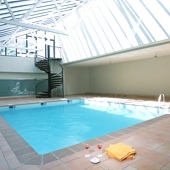 There is a heated indoor swimming pool, gymnasium and sauna at the Parador de La Seu D'Urgell. Distance from the nearest airport is approximately 200 kms, train station is 50 kms away and the nearest port is 200 kms away. My husband and I had picked this parador as a change from 4 days in bustling Barcelona, and we were not disappointed. 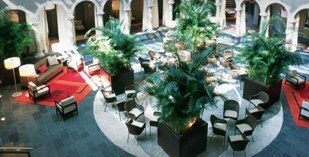 We felt immediately relaxed and thoroughly enjoyed 3 days in this splendid, wonderfully located hotel. The parador itself is clean and quiet and sunbathing on the roof is a real pleasure, overlooking the 14thC cathedral. The only negative, which is not specific to this parador alone, is that the restaurant did not open until 8:30 which is late for those of used to eating earlier. Would recommend without hesitation. We are four friends who stayed at this parador one night in early September after a fantastic walking holiday in AIgues Tortes. Dropping in from the street, we were taken well care of. Food quality was great, rooms were comfortable (especially after the packed huts in Aigues Tortes) and we appreciated the quiet yet central location of the Parador. Good access to internet was particularly appreciated, as I needed this to deal with a few work-related challenges. The nearby museum, where (among other treasures) they have an illustrated version of the Apocalypse from the 10th century, is an absolute must. I would warmly recommend this place for a stop while travelling through the beautiful region of upper Catalonia. Parador de La Seu D'Urgell is a hotel in the Pyrenees incorporating cloisters from the renaissance period.